An important part of exercise that is overlooked quite regularly by people learning to exercise is a stretching routine. I understand how eager people are to start training (this is a good sign) however to avoid injury it's very important to stretch before and after exercising. In this article I have highlighted a range of stretching exercises that are easy to follow and understand. The range of stretching exercises available today is quite staggering and start from the basic then move up to the overly complicated! but I wanted to create a guide that will give a good range of options, none of these stretches are complex and you can perform them where ever you are situated. I have provided a wide range of choices so you can do different stretches or combinations of stretches over many weeks without getting stuck in a boring routine. A good example to stress the importance of stretching is an elastic band being pulled apart rapidly at two ends and an elastic band being constantly stretched at it maximum stretching point. Notice, the rapid pull apart of the elastic band results in an immediate snap. However, the elastic band constantly being stretched continues to increase its max breaking point. This is much like the muscles and ligaments of our bodies. Heat flows via the blood being past through our body and as a result warming up all the parts used for exercise which helps bring relaxation to muscles and joints. This also reduces the possibilities of pulling or aggravating a muscle or joint as they tend to become more elastic during the warm-up phase of your workout. While the physical benefits of dynamic stretches and flexibility stretches are obvious, there are also mental benefits to your pre-workout warm-up. The warm-up routine helps to focus the mind on the task that lies ahead and leave other distractions from work, school, sports etc. behind you. Post warm-up, the body and mind should be fully prepared to take on the goal at hand whether it be complete every rep with perfect form or to endure every last minute of your work-out. Your warm-up and cool-down stretch before and after your workout respectively should follow a head-to-toe procedure. Starting with neck and continuing down through to the ankles. Prior to undertaking fitness stretching before your workout a light cardio (walking, jogging, cross training) of five minutes should be completed to warm-up. 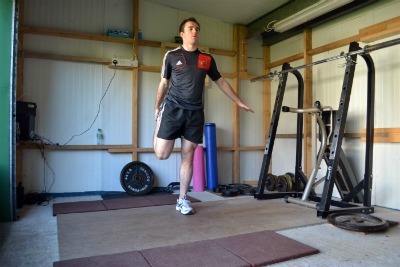 This is essential to avoid injury as muscles that are stretched when ‘cold’ are often susceptible to injury. So with the light cardio and workout out of the way it’s time to concentrate on our head-to-toe static stretching. There is no stretching equipment needed to complete this routine so you can pretty much do it anywhere you please! The muscles of the neck are our starting point of your stretch. Stand upright with your knees bent and your feet shoulder width apart. Interlock your two hands benhind your back. Now, pull your hands down toward the ground and push your chest up and out. You should feel your shoulders move back and feel a stretch in the chest muscles. Hold for 10 seconds. Put one arm behind your back touching your neck. With the opposite hand push the elbow of the hand behind your back downwards. You should feel a stetch in the tricep muscle. Hold for 10 seconds and repeat procedure on the opposite arm. 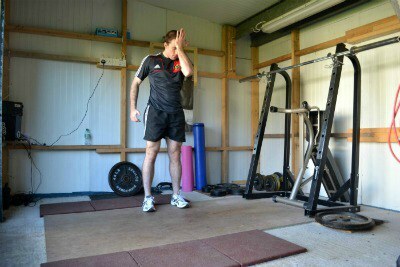 Firstly, pin the shoulders back into the body and hold them there. Then bring the arm across the chest and press the other arm on that arm in towards the chest. Hold for ten seconds on each arm and repeat twice. Finish with a double arm swing for 10 seconds to ensure a full loosening out. Standing upright, place one arm across the body. With the other arm force the point just above elbow in towards the body. A twinge should be felt around the shoulder area. Hold this poistion for 3 seconds and cross to the next arm. This process should be repeated several time at a fast cross over pace. Simply swing the arms back and then forward for 15 seconds each. Hold one hand behind you back and push the elbow of that arm down towards the ground. Repeat on the opposite shoulder holding for 10 seconds each time. With some light 2-4kg dumbells tilt the torso to one side and hold. Feel a stetch right upthe side side of the body. Hold for 5 seconds and repeat on the over side. With a medicene ball at hand place your knees on the ground. Place the Ball if front of you and put you hands side ways on the Ball. At this position push your body down to the ground feeling a stretch in your side Lat muscles. Here are some concise back stretches you can complete before your workout. Great dynamic stretches and flexibility stretches for improving your flexibility and preventing injury! Ly with hands and knees on the floor. Arch your back for 5 seconds then round your back for 5 seconds. Ly flat on the ground. Arch your back up and bend your neck back looking toward the sky. Now, sit back into your feet and round your back keeping your hands on the ground. Put your arms on either side of a door frame just below shoulder height. Force your chest through the door by leaning in. Sit upright with your two legs lying in front of you. Bend one leg and place it over the opposite leg. Push the knee outwards with the elbow while facing the other way. Hold for 2 seconds and repeat with the other leg several times. Bring your two leg in toward your body gripping them tightly. Now, round your lower back and feel the stretch. Bring one leg in toward your body holding it tightly. Hold for 10 seconds and repeat with the opposite leg. 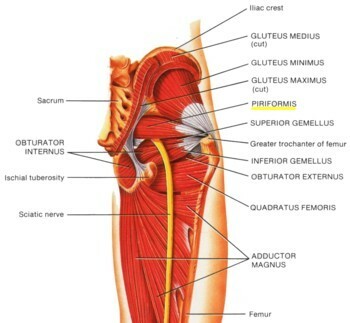 The Piriformis are muscles in the glutes, activated during all lower body exercises. These are stretched by lying flat on your back and pulling your knees toward the opposite side of your body. Perform for 10 seconds each side. The Soleus is found in the calf muscle. Place your foot on an object approximately 2 inches high. Push your knee forward while place downward pressure from your body through the knee. Hold for 10 seconds and repeat on the other leg. Simply just roll the ankle around clockwise and anti-clockwise. Complete for clockwise and anti-clockwise rolls for 5 seconds each, then change leg and repeat. Stand up-right and then place your heal on the ground 2 feet from your body. Bend into the extended leg, place your hand on your knee and tilt your upper body forward until you feel a slight pain in the back of the extended leg, the hamstring. Sit on the ground with your back upright and the soles of your feet touching each other. Pull your touching feet close into the body. Now, with your arms, force your bent knees in toward the ground while maintaining an upright back position. Ly sideways on the ground. Place the front of your foot in your hand and pull the leg back with the hand. Hold for 10 seconds and repeat, lying on your other side. Now pull this foot towards your glutes to feel a stretch on the frontal area of that leg. Ly upright on the ground and place the sole of one foot against the knee of your other straightened leg. Grab the toe of your straightened leg and pull it towards you. Hold for 10 seconds and repeat on the opposite leg. Sit upright with your two legs lying flat in front of you. Place your feet 1 meter apart and parallel to each other. Now with your hands on your waist lean to the left side and feel the stretch on the inside on the inside of your right leg. Place the top of your foot on an object approximately 2 inches height. Hold for 10 seconds each time. Roll each ankle around for 10 seconds while keeping your toe on the ground. Here are some exercise hip and piriformis stretches you can do to loosen the piriformis muscle and promote rotation of the hips. These are perfect if you feel a deep and dull pain within your glute muscles when doing any workouts that involve the legs such as running. The piriformis is one of many small muscles of the body located deep within the hip and buttocks region, It connects the lower area of the spine to the top of the thigh bone and aids in external rotation of the hip joint. There are many muscles and tendons that make up the hip and buttocks region, The piriformis is the horizontal muscle running over the top of the sciatic nerve. Start by lying flat on your back with your legs outstretched and your arms out wide. Now bend one knee and bring it up toward the body. Grab the knee with opposite hand and force the knee diagonally up and in toward your body. You should feel a twinge within the gluteus muscle which should stretch out the Piriformis muscles. Hold this position for 10 seconds and repeat on the other side. Begin facing forward on the ground with the arms straight above your head and legs in together. Now bend one leg and bring up, diagonally across the body. With your body weight lean backwards into your gluteus to effectively stretch and loosen out the piriformis. Hold this position for 8-10 seconds and then switch leg to get full piriformis stretches. Grab a towel or a tshirt for this piriformis stretch. Stand upright and hold this at two end a good bit wider than shoulder width apart. With the towel (or shirt) in this position, squat down below 90 degrees and then drive up through the heels. The front leg swing indirectly stretch out the piriformis and also stretch out the hips. Ly Flat on your back with your arms outstretched and your legs together. Now bring one leg across the body while keeping your back and arms on the ground. Hold this postion for 8-10 seconds and then do the same with the other leg. These are similar to front leg swing only you ly face down and swing you legs backward. Remember to keep your hands and upper body in contact with the ground! No more hamstring tears, calf twinges or hip strains with these dynamic stretches outlined below. Perfect before a good workout plan. Dynamic stretches seem to be more effective at reducing muscle stiffness, which is thought to decrease the likelihood of muscle tears. For this reason, many coaches now advocate static stretching away from competition to increase range of motion, and dynamic stretching prior to performing for injury prevention and preparation. Dynamic flexibility has been used successfully used by trainers and coaches to increase flexibility and possibly lower the incidence of injury. 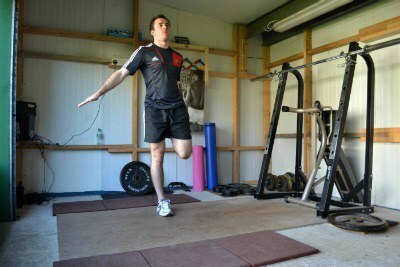 Dynamic stretching consists of controlled leg and arm swings that take you slowly to the limits of your range of motion. The first thing to prior to any stretching routine –dynamic or not- is do some light Cardio such as a slow jog or a brisk power walk. 2 minutes should be adequate enough. Now, outline a 10 meter area where you can undertake your dynamic stretches without being interfered with. Your first stretch should be the hamstring walk out to the 10 meter mark. To do these simply place one of your heals on the ground about 6 inches in front of these other foot. Now tilt your Torso forward until you feel a stretch in the back of your leg, the hamstring. Hold this position for a brief period of 3 seconds and repeat on the other leg. Alternate each leg until you reach the 10 meter mark. Try and do some fast feet in between stretches. The quadriceps holds begin with a high kick into air, followed by the same leg coming back until you can hold your foot in your hand behind your back. Repeat this out to the 10 meter mark, holding for 3 seconds and changing leg each time. 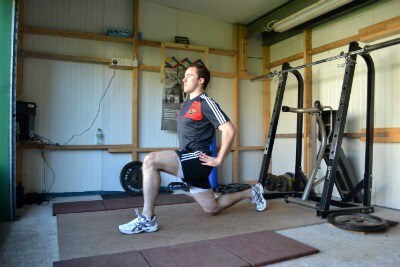 Similarly to the Hamstring Walk do some fast feet in between stretches. Lunges are great leg stretches for gluteus activation which helps improve power exerted by the body. Place one leg out keeping it perpendicular to the floor. 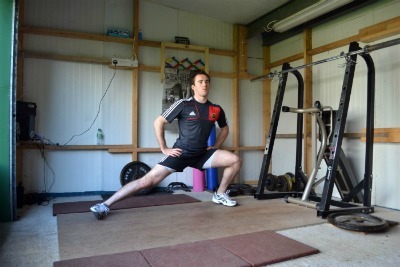 At the bottom position of the lunge explode upwards into a standing position. 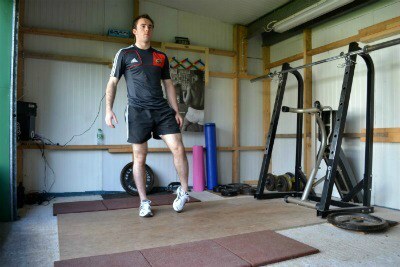 Alternatively, explode upward and while in the air switch your leading foot and land in lunge position. 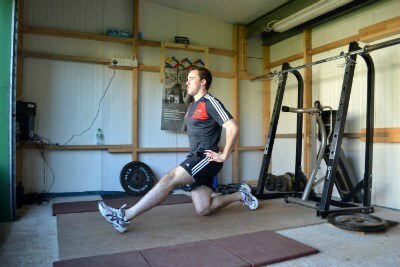 Really emphasize incorporating the gluteus and hips when driving up from the bottom position of the lunge. Again do these out to the 10 meter mark, changing feet every time. 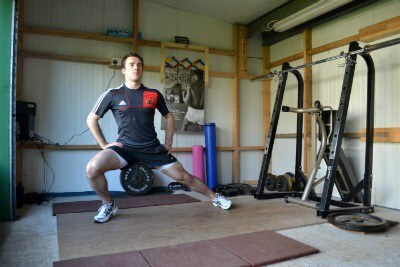 Squats in a similar way to the lunges are another great leg stretches to activate the gluteus due to the hip movement. The sumo squats are done like the name suggest. 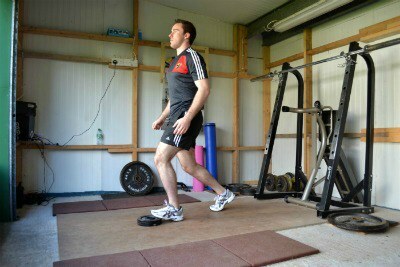 Walk a few feet out, turn sideways and squat down with the feet just wider than shoulder width apart. Try and get the squat below 90 degrees and again really incorporate the gluteus by driving up through the heels. 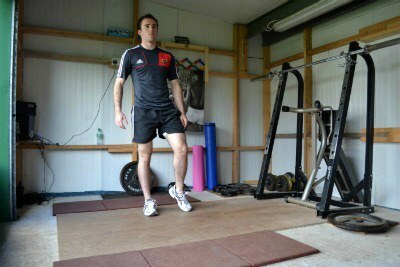 Again explode out of the squat into a standing position.